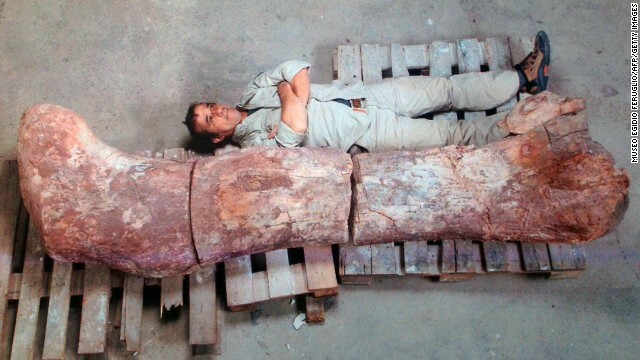 Argentinian paleontologists found the biggest dinosaur ever! The New Dinosaur discovered called as Titanosaurus. Found by Argentina’s Museo Palontologico Egidio Feruglio, Titanosaurus may be the largest dinosaur to grace the Earth. Titanosaurus was about 40 meters in length and 80 tons in weight. Titanosaurus itself comes from Greek word means “The Giants”. A Dinosaur specialist at the Argentinian museum, Luis Carbadillo said “It’s like two trucks with a trailer each, one in front of the other, and the weight of 14 elephants together.”. Titanosaurus was a herbivore dinosaurs, alive about 95 million years ago in the late of Mesozoic era. According to the museum, this fossils were found in Patagonia, which known as Dinosaur cemetery. The experts were able to piece together seven specimens of Titanosaurus. They believe that Titanosaurs were died together from dehydration or stuck in the mud. Now we have the biggest dinosaur ever, the Titanosaurus.